Today was exhausting and productive. Exhausting because the job just always has to poke at me with a sharp stick. And then last night I had diet coke too late and it made me sleep not well. Darnit. But many words were done and I am happy about that. Some introspection that may have to be cut later, but for now . . . And of course a shocking moment for one character. And someone nearly died. But about that the subject line . . . I have coverflats of The Turning Tide to give away. Dunno how many. They aren’t within reach. But at least six or seven. Here’s all you have to do to win. Between now and say . . . . next Thursday, the 21st . . . comment in this post. All you have to do is say something about something that happens in the book. Ask a question even. This may mean spoilers! So careful if you read the comments. Or . . . You can tell me something about what you expect or hope to see in the next book, based on what you read in The Turning Tide. I’ll draw for the winners (if there are enough answers) on the 21st. You can comment on the ljay or on the website (not both please). Also, if you’ve read the book and want to post reviews on BN or Amazon or your blog or what have you, I’d be grateful. And don’t forget. If you’re in the US and you want a printed map of Crosspointe, send me an email at dpf AT dianapfrancis DOT com and put Map in the subject line and your snail mail in the body, and I will send you one. If you are not in the US, I can email you a pdf. The Fabulous Ann Aguirre says . . .
Posted in Horngate books, Novels Comments Off on The Fabulous Ann Aguirre says . . .
Yep, it’s snippet Saturday. So I want you to post a snippet of your WIP in the comments. But my snippet is rather longish. You can have a gander at the first two chapters of The Turning Tide on my website. It opens with a blurb about what the book is about, but I’ll give you just a little bit more. First, this book introduces some new characters–Ryland, Shaye and Fairlie. We also get to see Keros (from The Cipher) a little–he gets a lot more face time in The Traitor King. You get to see a whole lot more majick and you get to learn a lot more about spawn. As usual, there’s mayhem and intrigue and bit of death and destruction for good measure. I hope you enjoy the first two chapters, and feel free to spread the word that they are posted! Now, show me your snippets . . .
Much depends on the sales of The Turning Tide. The initial print run is lower than I like, and I would love, LOVE to see it go into a second printing very quickly. This would also mean more books in the series. So. Do me a favor. Go order your copies, tell your friends, tell your enemies–tell the guy on the bus. If you like it, do reviews, blog, spread the word. If you don’t like it, that’s okay too. Go bug your bookstores and ask them to carry it if it isn’t there. Keep bugging them. I’ll post the first chapter or two in the next day or so. Look for it. Hope all is well wilth all of you. I am tired. And it snowed again today. Ug. I. Am. Tired. But the revisions for Bitter Night are done and winging their way through cyperspace to my editor. I hope she likes. And remarkably, they are on time. Due today, turned in today. Okay, not be 5:00 NY time, but nothing said they had to be, and as long as it’s before business open tomorrow, it counts. That’s my story and I’m sticking to it. Just at the moment I’m about cross-eyed with exhaustion. I need sleep. And I need to get back to work on The Traitor King. And there are one or two other things to get done too. No rest for the wicked. Or even for me. And the remarkable Ilona Andrews has been doing awesome things with my website. Go look. It’s got some issues, especially in IE, but I don’t care. It’s lovely. And I need to add content, I know. I’ll post the first chapters of The Turning Tide soon–how’s that? And now, collapsing in a heap. And trying to figure out how to cook dinner while in said heap. So far I’m not nearly as far along on the revisions for Bitter Night as I should be, but I am making progress. What’s interesting is that I’ve cut at least 6K words out (and I’m not quite a third through the revisions–I did say they were going slow). I say at least because though I keep a snippet file of bigger chunks I’ve cut, I don’t include single sentences or phrases or words in there and there’s been a lot of those and trust me, they add up. Anyhow, I’ve got a file of around 6K, and the novel is about 2K longer than it started out. So that means I’ve probably cut closer to 8K and put 2 K back in. But really, I’ve probably cut more like 12K and added back in about 4K. I’m still chopping–trying to make it lean and not saggy–and also I know of at least two scenes I need to add, and maybe a third, depending. I also have a scene I plan to cut. I’ve added one large scene already. My goal is to make this novel about the same length as I first submitted it. That’s not arbitrary. Well, yeah, to an extent it is. But I do believe I’ve been a bit wordy and in making those cuts, I’m trying to force myself to really pay attention and streamline the prose so it’s a really good, sharp read. 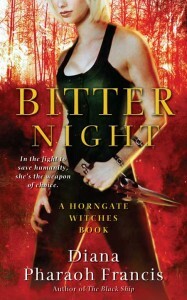 I just got the cover for Bitter Night. Here it is. Isn’t it awesome? Pardon me–I’m a fangirl. Hear me Squeeee!!! Have your heard of Ilona Andrews? Have you read Magic Bites and Magic Burns? I not, you need to go get them RIGHT NOW. I don’t mean wait until morning, I mean go find a copy this very moment–beg, borrow or steal it if you have to, but get them, read them, revel in them. And then, in two days, go buy Magic Strikes, the newest in the series. You must. You know how some people stood in line at midnight for Harry Potter and the Twilight books? I’d be in one for the Kate Daniels books by Ilona. I love these books. I know, I’m gushing. But I really really love these books. Here’s why. First, the worldbuilding is phenomenal. It’s unique Urban Fantasy. That’s one thing. Then there are terrific characters. They’re tough, I care about them–not just Kate, but the other major and minor characters as well. They are real and vibrant. There’s humor and snark, but it’s not for the purpose of humor and snark. It fits the story. The stories are not just murder mysteries, which is getting to be typical of UF, nor are they about some fairy incursion into the human world. The stories are more complex than that, and more integrated into this unique world. She integrates the folklore of our world into her stories in organic ways. There are shapeshifters and vampires, but not like you’ve met before. These are truly different. The novels also have rich prose, while at the same time being clean and quick to read. You hit the ground running and you don’t want to put the book down until you’re done, and you’re breathless the entire time. These are gritty and delicious. I’m telling you, I cannot wait to get my hands on a copy of Magic Strikes. Can. Not. Wait. There aren’t a lot of books out there that make me squee!!! like a fangirl. These do. Seriously. Grab them. Read them. Fast as you can. Posted in writers who are not me Comments Off on Pardon me–I’m a fangirl. Hear me Squeeee!!! So I have a first chapter of The Traitor King. I have no idea if it will still be part of the book later, because I am pantsing this book so much more than I like to. If I were to draw a plot line, it would essentially start with a list of characters who will be important: Keros, Margaret, Nicholas, Gimlet, Amberdel, Vaughn, the lord chancellor and his wife. Then there would be this line leading from Margaret and Gimlet, since they are where this chapter started, and then there would be this large, lovely, black scribble ball in the middle, taking up most of the page. Beneath it would be a caption saying “many bad things (and some good) happen.” Then there would be a teeny-tiny little line, maybe a quarter of a centimeter long, and it would lead to the word: END. YOu’ll note that what I know about this story is the character names. You’ll note I don’t know much else. Which isn’t true, really. I know a lot. I just don’t really know what will happen, nor the order it will happen in. I’m terrified. But here is a snippet for those of you who want to know how this begins . . . So on my sfnovelists post, someone asked the following in the comments. It’s such a great question, but I don’t know that I have a great answer. I am, however, going to take a stab at it. I would like for all of you to jump in, though. Diana I find I start writing but on the first edit after I’ve finished the first draft I will eliminate up to 7 chapters at the beginning because I’ve mainly written backstory. I don’t know why I do this, but it happens every time even if I plot the story out in its entirety. The first couple of chapters lets me get into my characters heads and then the story takes off from there. Don’t know how to break this habit. Do you have any suggestions?